Can one eat just plain cooked (with water) quaker oatmeal as a part of this fast? You want to avoid chemicals in foods. It’s funny because often it’s the less expensive brands that are the best! I use Kroger canned vegetables since most of the varieties are only the vegetable, water and salt. I encourage you to spend some time on this site and my blog as they have all the information and resources you need for a successful Daniel Fast. You can make your own salad dressings or my favorite is Newman’s Own Oil and Vinegar Salad Dressing. Whole wheat and all whole grains are allowed on the fast because of Daniel 1:12 – Prove thy servants, I beseech thee, ten days; and let them give us pulse to eat, and water to drink. Pulse is food grown from seed . . . so since wheat is grown from seed it’s allowed on the Daniel Fast. I need to know what kind of salad dressing is allowed on the Daniel Fast? Also could you explain to me how whole wheat is an approved food on the fast? I wanted to thank you for the information you sent me on my first Daniel Fast. I would have not been able to accomplish this fast without your input. Thank You and God Bless you Susan. I wll be starting my Daniel Fast Jan 10. I have never done a Daniel Fast before. I am sure glad I am not the only one doing this fast. Your prayers will help me accomplish this impossible request of my Lord Jesus for my walk with him. Getting myself prepared spiritually for this upcoming Daniel Fast on Jan 10. So many things are expected for 2010. I have been walking with the Lord for 25 years, but I find myself thirsting more & more for His Word. I know that this time is going to be one of intimacy with Him… Developing an intimacy on a deeper level. I feel as if I am gearing myself up for the many battles to face in 2010. Not just for myself, but for others. Armed with weapons on righteousness in the right and left hand. I expect the enemy to try to get me focus off of God, but I will seek Him diligently as never before. Looking forward to it. Sorry, all sweeteners are out during the Daniel Fast. However, I do encourage people to use agave nectar after the fast to get away from white sugar. Thank you, dear sister in Christ. Thank you so much for your post! 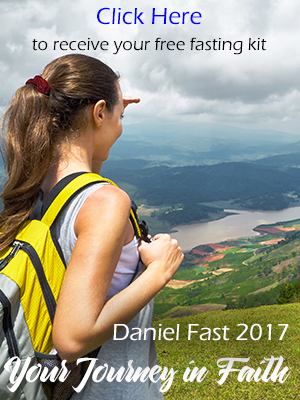 You and your family certainly discovered some of the amazing benefits of the Daniel Fast. I am thrilled to find that more and more followers of Christ are learning of this powerful spiritual discipline. You are in my prayers regarding your health. My prayer is that you will grow in your identity as a child of the Most High God. Claim His promises as they for you! Your Father wants you healthy and Christ gained our divine health at the cross! May God continue to order your steps! Thank you so much for sharing your insight and experience. And also for your support and prayers. Our God is so good and the more we trust in Him the more He can do through us, with us, in us, and for us. As you know, a deep relationship with God has endless rewards, but it’s not for the faint of heat. It takes diligence and consistency. But even though the road is narrow, it’s the only road I want to be on. I could never turn back or even detour. I know too much of the goodness of God to change now! Be blessed, Cindy, and thanks for your post! I will be praying for you to experience God in a new, refreshed and even deeper way, as you partake of this most recent/latest Daniel Fast. It is amazing to me that you have begun this within the same time frame that I myself am now looking (and praying about) to consecrate myself on deeper levels with the Lord… specifically through my lifestyle, eating habits and regular practice of spiritual fasting. As of June 30, 2009, I completed what I call, “the year of the fast”- a time of continual Daniel Fasting alternating with liquid fasting that I began in May, 2008. It was an incredible, awful, horrible, wonderful year-long journey with Jesus, (and fasting) that I still have not quite figured out all the spiritual lessons I may have learned along the way.